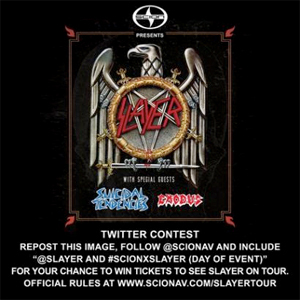 Scion, which previously announced its partnership with SLAYER, is offering five lucky fans the opportunity to see the iconic, thrash-metal outfit as they trek across the US next month. The Twitter-based ticket giveaway for five pairs of tickets per city launches today and runs through December 6th. Entries should be submitted through twitter.com/scionav. Complete rules are available HERE. Scion previously announced a separate contest offering 10 existing ticket holders and a ticket-holding guest the opportunity to meet the band at meet and greets in Oakland (November 12th only), Los Angeles, Austin and Montclair, N.J. Further information and an entry can be found HERE.